Lambright Pest Control Services Inc. offers the convenience you need at affordable prices with very speedy and professionally uniformed employees. Our locally owned and operated pest control company was established in 2001 by an owner who is hands on every day in the field. Customers often thank us for our timely and quality service. Thank you Mrs. Moore for taking time out of your busy schedule to rate your experience with us. We truly appreciate you giving us a 5 star rating and being a loyal customer with Lambright Pest Control! Thank you Ms. Duggins for taking time out of your busy schedule to rate your experience with us. We truly appreciate you giving us a 5 star rating and being a loyal customer with Lambright Pest Control! Very professional! I will definitely use them again! Thank you Mrs. Harrison for taking time out of your busy schedule to rate your experience with us. We truly appreciate you giving us a 5 star rating and being a loyal customer with Lambright Pest Control! Very nice and professional reps. We were told we would see more bugs for a few days after cuz they are dying off but we have seen none! Thank you Mrs. Jones for taking time out of your busy schedule to rate your experience with us. We truly appreciate you giving us a 5 star rating and being a loyal customer with Lambright Pest Control! I love Lambright pest control because the service is excellent and they go that extra mile to work with you . Thank you. Thank you Mrs. White-Miller for taking time out of your busy schedule to rate your experience with us. We truly appreciate you giving us a 5 star rating and being a loyal customer with Lambright Pest Control! Thank you for taking time out of your busy schedule to rate your experience with us. We truly appreciate you giving us a 5 star rating and being a loyal customer with Lambright Pest Control! I was very impressed with the knowledge of Rick when he provided my service. Thank you Mr. Shuler for taking time out of your busy schedule to rate your experience with us. We truly appreciate you giving us a 5 star rating and being a loyal customer with Lambright Pest Control! All is well. Service is great. Thank you Mr. Parker for taking time out of your busy schedule to rate your experience with us. We truly appreciate you giving us a 5 star rating and being a loyal customer with Lambright Pest Control! Thank you Mr. Mullinax for taking time out of your busy schedule to rate your experience with us. We truly appreciate you being a loyal customer with Lambright Pest Control Services! Thank you Mr. Johnson for taking time out of your busy schedule to rate your experience with us. We truly appreciate you giving us a 5 star rating and being a loyal customer with Lambright Pest Control! Thank you Ms. Simmons for taking time out of your busy schedule to rate your experience with us. We truly appreciate you being a valued customer with Lambright Pest Control Services! The Rep came out n access the issue n quickly took care of the problem. Thank you Ms. Smalls for taking time out of your busy schedule to rate your experience with us. We truly appreciate you giving us a 5 star rating and being a valued customer with Lambright Pest Control! Thank you Mr. Sanders for taking time out of your busy schedule to rate your experience with us. We truly appreciate you being a valued customer with Lambright Pest Control Services! Extremely happy so far...can't WAIT til I can't see any more of these CRITTERS CUZ I HATE THEM with a passion!!! I'm TRYING to be patient...lol 2 treatments so far....Love your extemely knowlageable men that come to do the extermination....Thank you again for your AWESOME SERVICE!! Shirley Ondercin. Thank you Ms. Ondercin for taking time out of your busy schedule to rate your experience with us. We truly appreciate you giving us a 5 star rating and being a valued customer with Lambright Pest Control! The thec was very polite and professional job well done thanks. Thank you Mrs. Holback for taking time out of your busy schedule to rate your experience with us. We truly appreciate you giving us a 5 star rating and being a valued customer with Lambright Pest Control! They answered all my questions and work with my schedule. They were on time and very pleasant. Thank you Ms. Baker for taking time out of your busy schedule to rate your experience with us. We truly appreciate you giving us a 5 star rating and being a valued customer with Lambright Pest Control! I'm happy with my services! Thank you Mrs. James for taking time out of your busy schedule to rate your experience with us. We truly appreciate you giving us a 5 star rating and being a valued customer with Lambright Pest Control! Yes, I was happy with the service. Broderick Clement was quite knowledgeable about the services you offer. Thank you Ms. Patterson for taking time out of your busy schedule to rate your experience with us. 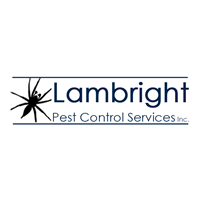 We truly appreciate you being a valued customer with Lambright Pest Control Services! Professional and friendly! Easy to work with. Thank you Mr. Weatherford for taking time out of your busy schedule to rate your experience with us. We truly appreciate you giving us a 5 star rating and being a valued customer with Lambright Pest Control! Very friendly and helpful. I would recommend them to everyone I know. Thank you. Thank you Ms. Boyd for taking time out of your busy schedule to rate your experience with us. We truly appreciate you giving us a 5 star rating and being a valued customer with Lambright Pest Control! They did a great job spraying my house the guy was very respectful. Thank you Mrs. Riley for taking time out of your busy schedule to rate your experience with us. We truly appreciate you giving us a 5 star rating and being a valued customer with Lambright Pest Control! Great company and are willing to give back to the community. Thank you Mr. Clark for taking time out of your busy schedule to rate your experience with us. We truly appreciate you giving us a 5 star rating and being a valued customer with Lambright Pest Control! Thank you Mr. Davis for taking time out of your busy schedule to rate your experience with us. We truly appreciate you giving us a 5 star rating and being a valued customer with Lambright Pest Control! HAVING TO WORRY ABOUT BUGS GETTING IN IT. Thank you Ms. Wiggins for taking time out of your busy schedule to rate your experience with us. We truly appreciate you giving us a 5 star rating and being a valued customer with Lambright Pest Control! Great people to use for pest control and insulation. Thank you Mrs. Mitchell for taking time out of your busy schedule to rate your experience with us. We truly appreciate you giving us a 5 star rating and being a valued customer with Lambright Pest Control! Thank you for taking time out of your busy schedule to rate your experience with us. We truly appreciate you being a valued customer with Lambright Pest Control Services! Thank you Ms. Jacques for taking time out of your busy schedule to rate your experience with us. We truly appreciate you giving us a 5 star rating and being a valued customer with Lambright Pest Control! I was very pleased with Broderick Clement. Thank you Ms. Nutting for taking time out of your busy schedule to rate your experience with us. We truly appreciate you giving us a 5 star rating and being a valued customer with Lambright Pest Control! My home is in Mt. Pleasant, SC. Wish your services were available there. Thank you Dr. Wapner for taking time out of your busy schedule to rate your experience with us. We truly appreciate you giving us a 5 star rating and being a valued customer with Lambright Pest Control! Will refer to more customers in the future because I am very satisfied with the service. Thank you Mr. Dash for taking time out of your busy schedule to rate your experience with us. We truly appreciate you giving us a 5 star rating and being a valued customer with Lambright Pest Control! They were extremely helpful on informing me of what was happening from the time he arrived until the time he left. Great service, I am truly grateful for the service and looking forward to the future with this place. Thank you Mr. Smith for taking time out of your busy schedule to rate your experience with us. We truly appreciate you giving us a 5 star rating and being a valued customer with Lambright Pest Control! Thank you Ms. Smith, for taking the time out of your busy schedule to write a review on your experience with us. We truly appreciate you being a valued customer with us. We have been very pleased with your service! Thank you Ms. Reed, for taking the time out of your busy schedule to write a 5 star review on your experience with us. We truly appreciate you being a valued customer with us. Lambright does a awesome job... Rick takes his time and is very thorough with what he does. Thank you Ms. Shuler, for taking the time out of your busy schedule to write a 5 star review on your experience with us. We truly appreciate you being a valued customer with us. Thank you Mr. Brown, for taking the time out of your busy schedule to write a 5 star review on your experience with us. We truly appreciate you being a valued customer with us. No mosquitoes or bugs so far! Rick is very good and helpful. Thank you Mrs. Owen, for taking the time out of your busy schedule to write a 5 star review on your experience with us. We truly appreciate you being a valued customer with us. Highly recommended! This team has been providing service to our business for Alma for over four months now we are very happy with the results and the quick, discreet service. Thank you! from the team at barking mad Pet Supply. Thank you Barking Mad Pet Supplies, for taking the time out of your busy schedule to write a 5 star review on your experience with us. We truly appreciate you being a valued customer with us. Great service!! Can see the results in a matter of minutes!! Thank you Ms. Bailey, for taking the time out of your busy schedule to write a 5 star review on your experience with us. We truly appreciate you being a valued customer with us.